Posted: Sat Dec 02, 2006 2:41 pm Post subject: Winter Jasmine, Jasminum nudiflorum for Winter Colour. Mention the word Jasmine to most house owners and they immediately think of the many products with the essence of Jasmine, which reside within their homes. The plants wonderful heady scent is used to infuse everything from room fresheners to scented candles. Jasminum officinale, the summer flowering Jasmine provides us with that glorious scent, whereas its close relative Jasminum nudiflorum shuns summer fragrance in favour of a dash of winter colour. Appropriately enough, because of its winter showing, Jasminum nudiflorum is commonly known as Winter Jasmine. 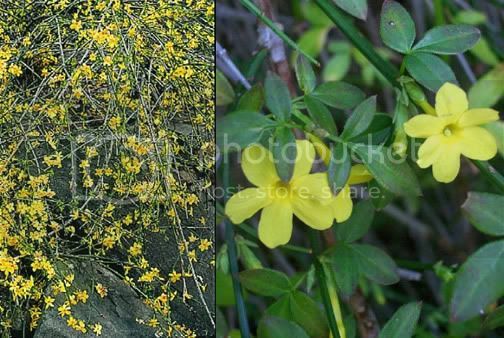 Photo / pic / image of Winter Jasmine, Jasminum nudiflorum. A deciduous rambling shrub, the beauty originally grew in China before being introduced to the west by the plant hunter Robert fortune in the 1800's. As well as being directly related to summer flowering Jasmine, Jasminum nudiflorum is unsurprisingly a direct relative of winter flowering heather, another provider of colour to brighten up dull grey winter days. Winter Jasmines flowers, small yellow star-like blooms about 2.5cm (1 inch) across, emerge with six petals from glossy reddened buds as early as late autumn each year. These blossoms are reliably produced in abundance throughout winter on flexible whippy stems, which have a cascading growth habit. The stems, while supporting the flowers are slender and leafless, however, once the plants flowering period is over the missing flowers are made up for by a compensating flush of dark green oval leaves. Like most medium sized shrubs, Jasminum nudiflorum can be grown as a stand-alone plant in a bed or border, but it is more commonly employed as a wall shrub due to its trailing stems. If planted at the base of a south or west-facing wall, a gardener can quite easily expect this Jasmine to cover a 3 metre by 3 metre (9ft) section of wall area in 5 to 10 years. Although growing and flowering slightly better on a sunny wall, it will also produce more than adequate blooms in a shaded location, so its ideal for Ireland I hear you say. I highly recommend this plant if you have a darkened north facing wall that prevents you from growing the more sun loving climbers such a Clematis. Remember, that Jasmine is a wall shrub not a self-clinging climber, so it will require some form of support such as horizontal wires or strong trellising. You will find that Winter Jasmine grows well in any clay soil with a fair addition of compost or well-rotted farmyard manure. As well as being easy to grow, cuttings from Jasminum nudiflorum easily root any time during the growing season. So easy in fact that Winter Jasmine can unfortunately root anywhere the cascading branches happen to touch moist soil, this can rapidly become difficult to control if let run rampant. For all you adventurous gardeners out there, you can try growing Jasminum nudiflorum as a cascade shrub, planted atop a soil backfilled wall or bank, allowing it to trail its welcome winter colour downwards towards the viewer. Jasminum nudiflorum and Jasminum officinale ground covers are more decorative than effective, but still worth a try. I would have to agree that it truly is a great plant. I have some planted through some ground cover cotoneatester and I have seen some planted through some ground cover Lilac and It looks very well. It provides a goof fluch o colour on an otherwise green plant in the winter months. can anyone tell me if they know somewhere in cork where you can buy this??? Brief Cork garden centre list below. Most will have it in stock, if not suppliers can get it to them in a week or so. thanks for that verge, i've been into a few of them but they have hardly any jasmine plants there at all nevermind the winter version. do you know how much a plant would cost by any chance??? the best normal jasmine i've seen is jasmine azoricum which was nearly â‚¬30! What other winter flowering plants would you recommend ? I have a few deliberate gaps in my front flowerbed that I intend to fill with winter flowers shrubs, but I think the Jasmin would be too big. Are there any other scrubs that grow to about 1 foot tall that you could recommend that are availabe in most garden centres ? I am going crazy trying to find this plant. The only one I have found is Gelsemium sempervirens, which is also yellow, but it is only hardy to 2 degrees Celsius. There is Jasminum officinale which is hardy to -1, but it is white. I need yellow. Isn't there one hardier than that also in yellow? You can get 2 winter flowering jasmine for less than 10euros bare rooted, but postage brings up the price to about 20euros total. Thinking of training mine against a south facing house wall in a deep container. It is a fairly protected spot and has an overhanging soffit, which the plant will outgrow as it matures. There can be strong drying winds which may clip the edges of the plant. For example, a boxed topiary plant needs a lot of water in that spot to stay in good colour. Do you think that, this location etc is suitable for the winter flowering jasmine? very big plants (seems bit pricy now!) and have them on full sunny wall .. But the plant doesnt look very healthy, specially the leaves dont have a shine..
believe needs a good pruning..